FREE APPRAISAL. If you would like to auction, buy, consign or sell a Walt Disney Fantasia art in our Walt Disney Fantasia art auction, please email Nate@NateDSanders.com or call Nate D. Sanders Auctions (http://www.NateDSanders.com) at (310) 440-2982. Hand painted animation cel from the Walt Disney classic “Fantasia”. The groundbreaking animated film is widely recognized as revitalizing the character of Mickey Mouse. 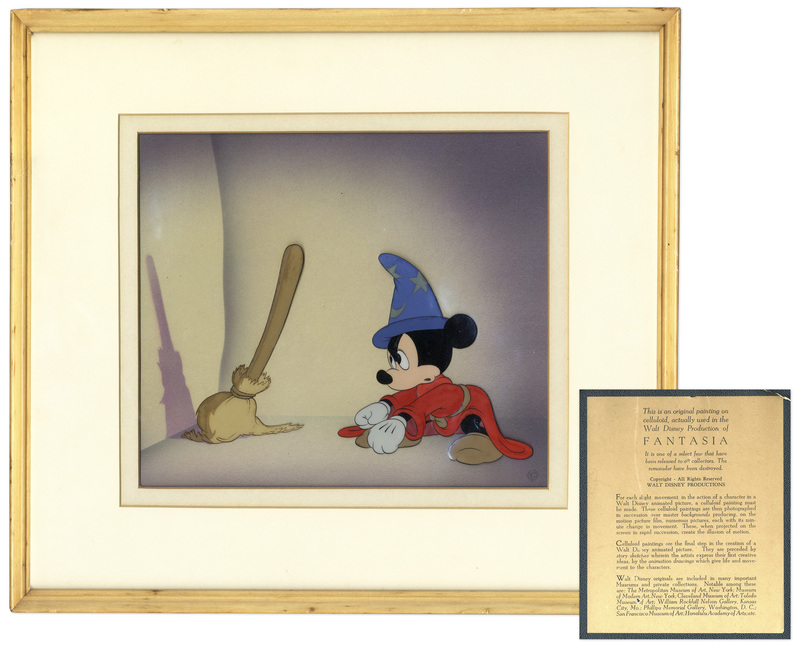 Cel depicts Mickey, clad in his iconic sorcerer’s hat and red robe during the “Magic Brooms” segment, the most memorable portion of the film. Cel measures 11″ x 10″, framed to 16.5″ x 15″. With original Disney label on verso of frame. Near fine condition. Sold for $11,000. 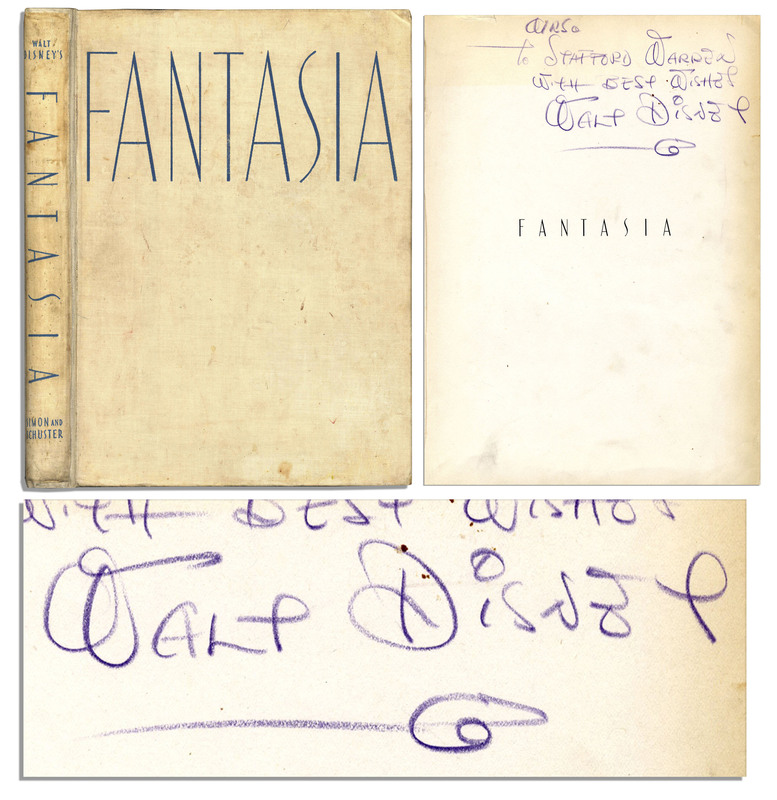 Scarce Walt Disney signed copy of his animated masterpiece, ”Walt Disney’s Fantasia” by Deems Taylor. With an introduction by Disney and a foreword by Leopold Stokowski, conductor of the Philadelphia Orchestra who scored the motion picture. Simon and Schuster: New York: 1940. First edition. Book has ”Danny Moyer” written to cover and is signed by various Disney members inscribing notes to Moyer, including Disney himself who signs title page, ”To Danny Moyer / With Best Wishes / Walt Disney” in his iconic handwriting. Book has 20+ incredible personalized illustrations throughout, presumably by various Disney illustrators who additionally write personal notes to Moyer wishing him good luck in his next endeavor. Illustrated book contains a wealth of background information on the groundbreaking animated classic, including blurbs about the pieces of music performed for it. 158pp. are bound in putty color cloth boards with blue print lettering, measuring 9.5” x 13”. Some foxing, toning and wear throughout, and splitting along spine. Housed in a blue cloth slipcase with elegant leather spine. Very good condition. Excellent example of a Walt Disney Fantasia art item. Sold for $6,250. 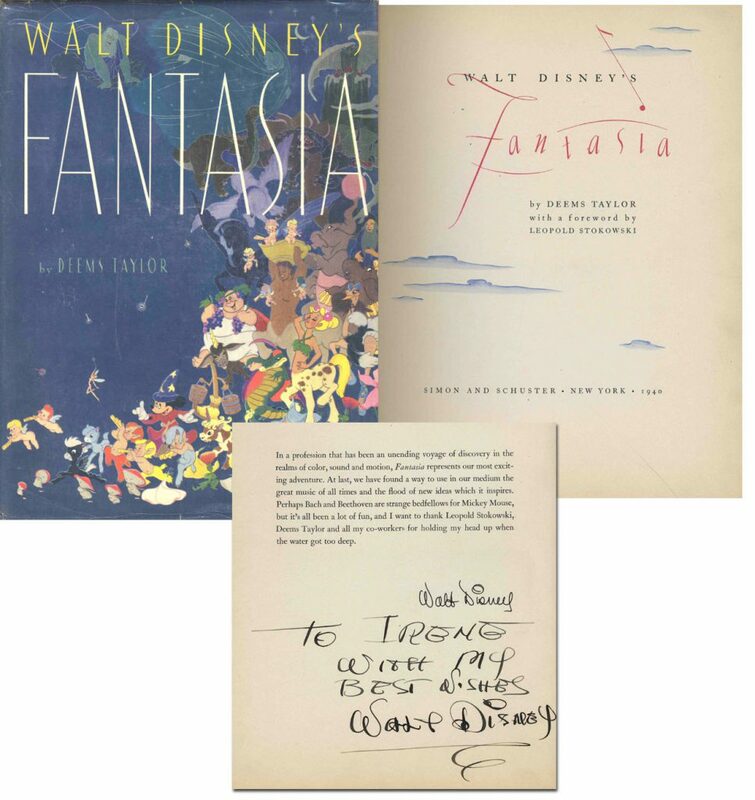 Walt Disney signed rare book, “Walt Disney’s Fantasia” by Deems Taylor; with a foreward by Leopold Stokowski, conductor of the Philadelphia Orchestra during the scoring of the motion picture. Simon and Schuster: New York: 1940. First edition with original first edition dustjacket. Signed in ink to gratitude page, “To Irene, With My Best Wishes, Walt Disney.” The book version of Disney’s “Fantasia” with a magnificent gallery of pictures, most in exquisitely vivid color. Accompanied by a Certificate of Authenticity by David R. Smith of the Walt Disney Archives. Folio with tan cloth covered boards. Blue text on the spine and front board; illustrated end papers. Dustjacket shows price of $3.75. Autograph is bold and in mint condition. Volume shows wear to board ends and some soiling to top page edges. An exceptional piece of Disneyana in very good condition. Stellar example of a Walt Disney Fantasia art item. Sold for $4,440. 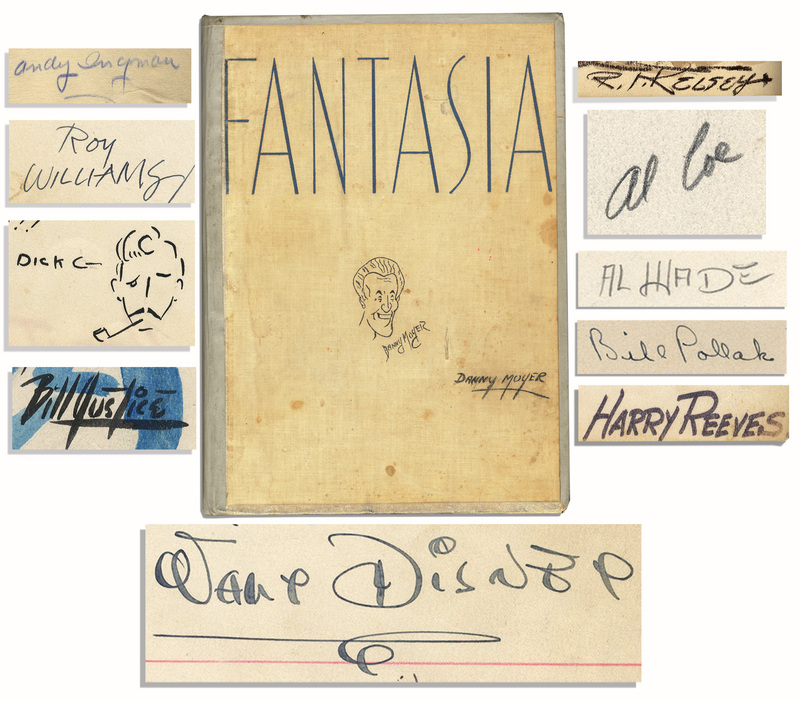 Scarce first edition of ”Fantasia” signed by animation pioneer Walt Disney. First edition published by Simon and Schuster: New York: 1940. Large tome is inscribed upon the front free endpaper in purple crayon in Disney’s distinctive hand, ”To Mrs. Stafford Warren / With Best Wishes / Walt Disney”. Illustrated book contains a wealth of background information on the groundbreaking animated classic, including blurbs about the pieces of music performed for it. 158pp. are bound in manilla cloth boards with blue print lettering, measuring 9.5” x 13”. Expert strengthening to boards, which are slightly soiled, overall very good. With COA by Disney expert Phil Sears. Sold for $3,125. 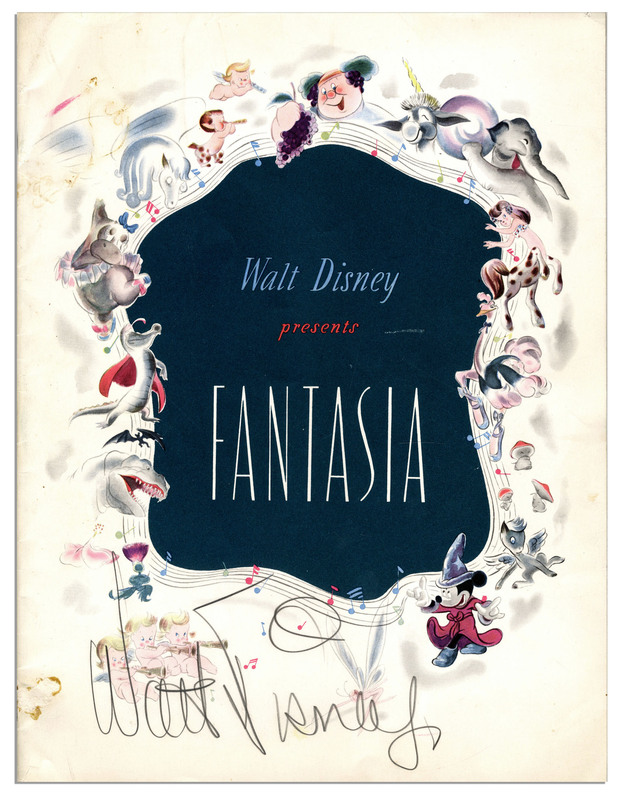 Program from the groundbreaking film ”Fantasia,” signed by its mastermind ”Walt Disney” in very large script on the lower portion of the front cover. In ”Fantasia,” Disney chose to omit dialogue from the animated feature in favor of famous classical music pieces composed by the greats. Leopold Stokowski conducted the Philadelphia Orchestra for the soundtrack. In 1940, ”Fantasia” was the first commercial film to debut stereo sound. 24pp. program measures 9.75” x 12.75”. With Phil Sears COA. Sold for $2,886. 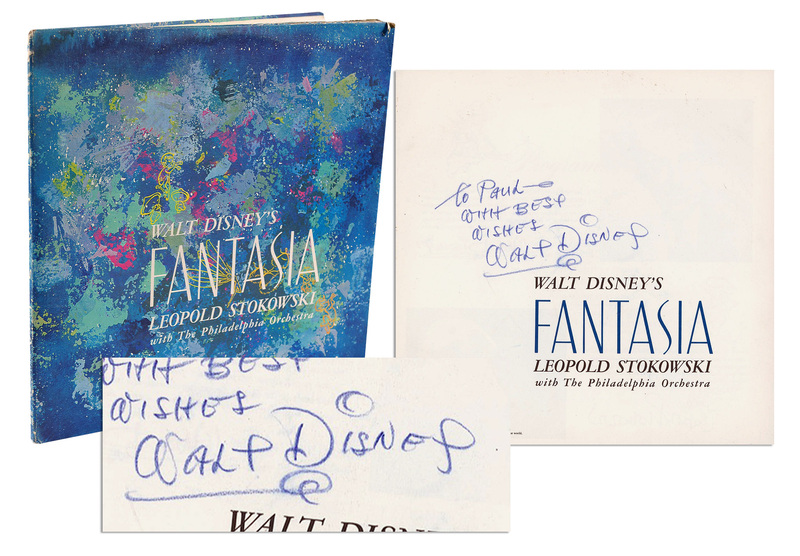 Walt Disney’s distinctive autograph appears on the first page of the integral booklet that accompanies the soundtrack to Walt Disney Productions’ animated feature, ”Fantasia.” Disney renders the inscription in blue wax pen, ”To Paul / with best wishes / Walt Disney”. Disney omitted dialogue from ”Fantasia” in favor of classical music conducted by Leopold Stokowski and performed by The Philadelphia Orchestra. The feature broke ground as the first commercial film to debut stereo sound. Partial separation to front cover, a small ding to back cover, and some light surface loss and rubbing to spine. Very good to near fine. Three vinyl records are included. An extraordinary item signed by its legendary creator. With PSA/DNA COA. Sold for $2,082.